Submitted by Shadooow on 2016-07-02 14:00. This is an updated/improved version of old Abyss Tileset which is widely used in multiple modules. This includes tilefade issues and white gaps in few tiles. Ever hated the water drips around lavawall? I changed the water drips color to red so it looks way better. 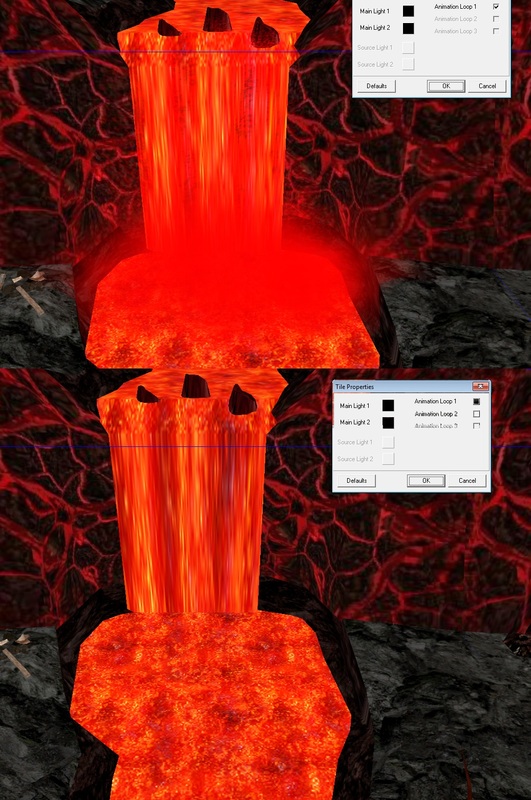 Tiles with lavafalls has the lava drips emitters as animloop which allows builder to turn them off (see image above). 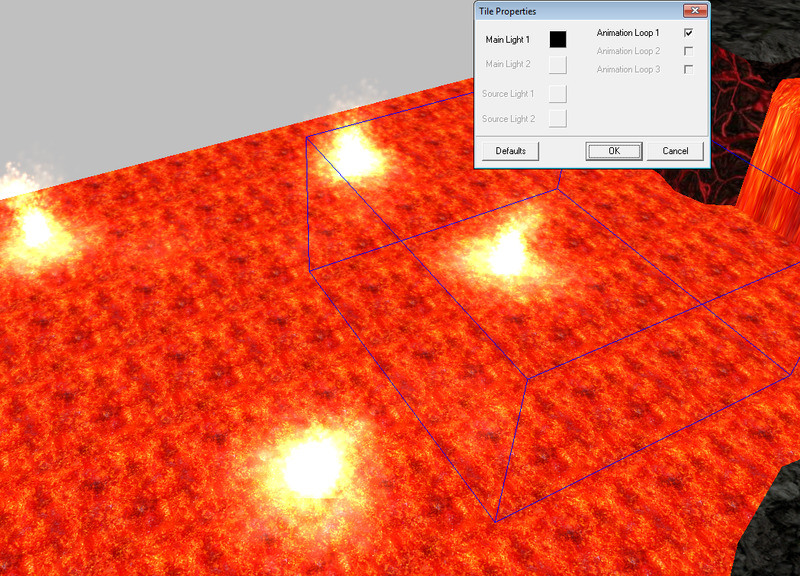 Also, the one lava tile now contains a lava explosions emitter. This will however manifest in your previous areas automatically, so if you don't like it, you need to revisit your areas and turn the animloop off. Tileset used minimap images from Rural tileset. 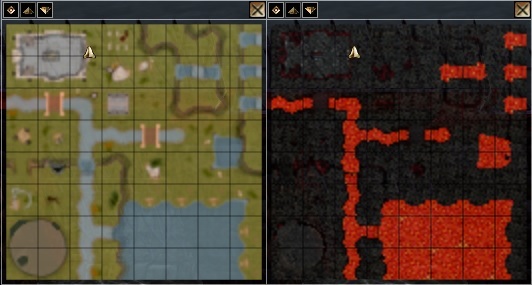 I created a brand new minimap images with matching colors. 5) Many textures restored to Bioware original. Many of them weren't changed at all only renamed to aby01. I changed textures with none or unnoticeable differences to vanilla textures from rural/dungeon tilesets. This overally improves a visual quality of tileset. 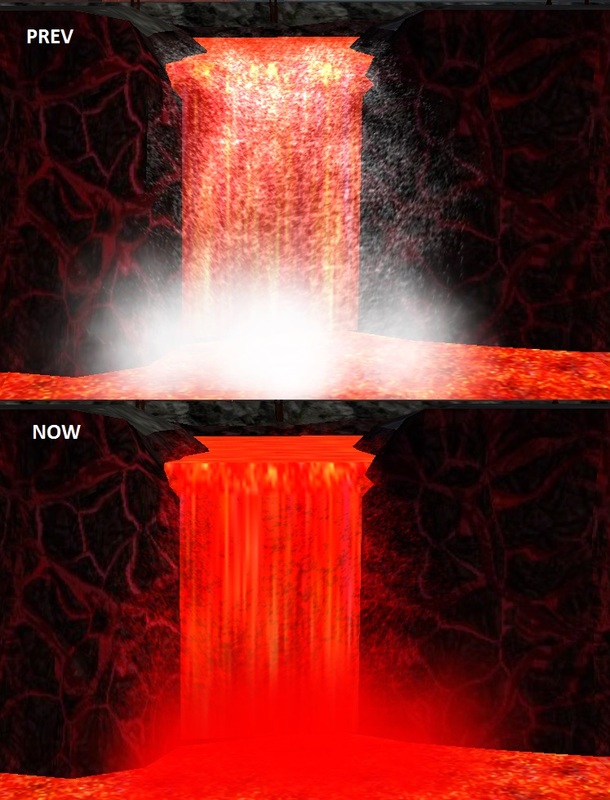 The most noticeable effect can be seen on lava see image above. As a simple reskin, the actual wakmesh for floor stayed "Grass". This was changed to "Stone" to match the actual floor texture. So moving in the area created in this tileset will not play a grass footsteps anymore. Grass -> Floor, Water -> Lava, Tree -> Dead Tree, etc. There were several groups and features which were crashing toolset since the files were missing. Large ammount of meshes were invisible via transparent texture. This is a nice trick to avoid anoying manual work, but I took the time and removed all these meshes as well as the transparent textures. This should improve performancy in area loading. While this won't be much noticeable on today's computers anyway it's always better practice to do it this way. Since some older PCs often can't render DDS textures, TGA is pretty much a must, but then there is no point in DSS - those are just compressed TGAs. Removed door models (weren't ever needed), removed (now) unused textures, removed unused models, edge tiles walkmesh and all models ran through cleanmodels. Can this be safely used as override? This is tricky. I noticed crash issues when I was using override tiles with animloops before. It was very weird and I didn't get reliable results but still. In singleplayer, yes this is safe to use as override. In multiplayer, I would not recommend it. You can try it, but if you get a crash in area loading screen be sure its caused by this animloop client/server mismatch issue. Anyway. Try it. If you get crash issues, report back to me and I can prepare a animloop-less version of this tileset update.